Ok, the title of this post is perhaps a bit too long, but I tend to be indecisive in my titling trends. I sat down to attempt to "review" A Christmas Carol*, but really, is that possible? What can little me add to the canon of critiques of Dickens' works? And so, instead of an actual book review, I found myself reflecting on the experience of reading this novella - for the first time, might I add - and wondering at its familiarity. Not unlike several other bloggers out there, I have been making an attempt to turn my attention away from some of the glitzy galleys that arrive in the mail and back towards the classics that line my shelves in all shapes and sizes. A Christmas Carol marked the first completed book in this personal challenge - and as I started it, I found myself distracted by my constant thoughts of, "How have I made it this far into life without actually reading the book?" More than that, however, I was struck by how familiar the pages were. Not just the story line, mind you, but the words themselves. This is, of course, because I broke my cardinal rule of bookish movies, and watched the movie (or rather, several renditions of it**) before ever reading the book. But that familiarity, the nostalgia associated with what have always been my favorite parts, the knowing what words, phrases, and sentences were to come next, were paired with an equal amazement at the new-ness of it all. Take, for example, the fact that the original ghost of Christmas past is a man. Or that the novella itself is actually quite humorous (which Red of What Red Read also noted in her recent post on A Christmas Carol)? And, more than anything else, the fact that Scrooge, though certainly crotchety in the opening pages, actually begins his transformation into a new man much earlier in the ghosts' visits on than any of the movies represent. Altogether, reading Dickens' actual words*** provided a new glimpse into a story I thought I already knew, and proved to be a unique experience that mimicked re-reading, yet of a book I had never read. I'm not sure that I could do this with many other titles - Dracula and The Princess Bride come to mind, but nothing more. You? Any books you could "re-read" for the first time? Or have you done so already? * Favorite being the 1980s made-for-tv version starring George C. Scott as Scrooge. 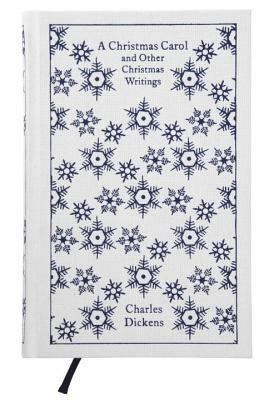 ** I read the novella (and Dickens' other two Christmas novellas) in a beautiful, red leather-bound edition from Dalmatian press, which appears to be out of print. Which is really too bad, because I was going to recommend primarily because the paper they used is so velvety soft that it was a joy to hold and read. **I actually read Dickens' handwritten words last year at the Morgan Library, where they display the original manuscript of A Christmas Carol every year. It. Was. Awesome. Yay! Someone else thinks the 1984 George C Scott version is the best other than my Dad and I! Woo hoo! I've had the same feeling of familiarity and wonder when reading classics. I also marvel at how one could trace modern styles and characters and stories back to these same old books. It's really so cool. Tribute Books - Glad you enjoyed it! Jan - YES! It's my dad's favorite, too (I'm sure I inherited my love for it from him, really). Trish - It really is fun, isn't it? Some of them are completely new, but some of the standards are really, really familiar and new at the same time. Great thoughts on a wonderful book. This was actually the first Dickens I ever read. My 7th grade English teacher tackled it in class, and even at that point, I was so familiar with the story I was afraid I'd be bored. Not so! I found it a thoroughly enriching experience. Andi - I think it would make a great first introduction to Dickens, if for no other reason than the length isn't as daunting as some of the others.